This Ubuntu Tablet Design Could Almost Pass As Real - OMG! Ubuntu! That was the sound made by my drool made as it hit the ground upon opening my inbox this morning and finding this slick Ubuntu Tablet Concept by Deviant Art user spiceofdesign staring back at me. 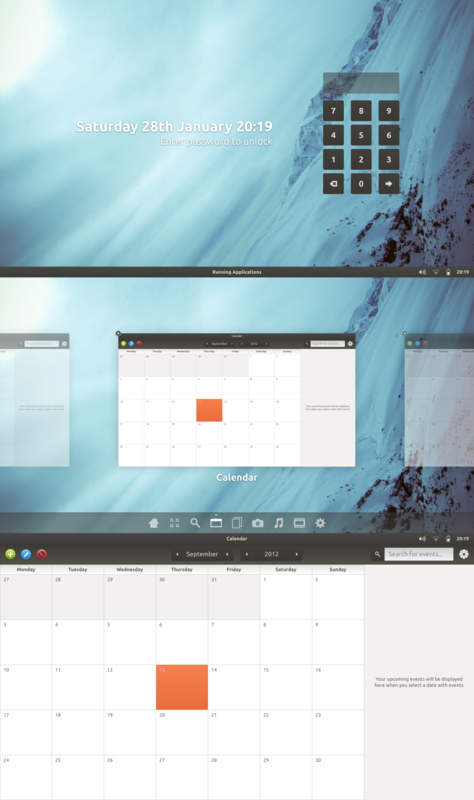 Now, I know you’re probably thinking “Concept, Schmoncept”, but I’m going to shun my fear of hyperbole and say that this mock-up has to be one of the most plausible Ubuntu tablet interface designs I think I’ve seen. And that’s despite the fact that it doesn’t feature ‘Unity‘ – the interface to be used in Ubuntu’s multi-device plans. “The first screen is just an unlock screen, nothing too fancy there, with a numeric password unlock. The second screen is the home hub. The hub has many different views, the icons to switch between them shown at the bottom (home, applications, search, running applications (which disappears if no applications are open), documents, photos, music, videos, preferences). There could be more views added, such as downloads or social views. At the top is the title and indicators bar, and in the middle running applications (I know I have repeated the same application three times, but I was being lazy here). Is this how you think an Ubuntu tablet interface would look? Would you expect something more Unity-based? Let us know your thoughts and ideas in the comments below.